With Thanksgiving upon us once more, I thought I’d dedicate some blog space to the handful of Thanksgiving animated specials that’ve aired. The first entry is the classic 1973 “Peanuts” special “A Charlie Brown Thanksgiving.” While it’s not as strong as the Halloween or Christmas specials, this one’s still pretty funny. 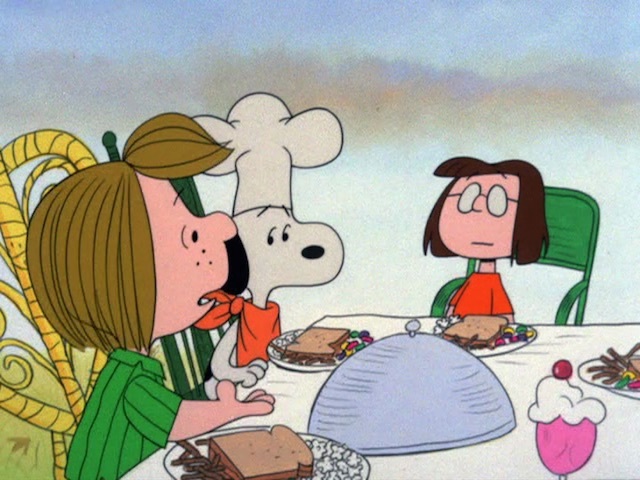 The plot consists of Charlie Brown fretting over Peppermint Patty inviting herself (plus Marcie and, in his first animated appearance, Franklin) over to “Chuck”‘s house for a Thanksgiving dinner. There’s two problems: one, Charlie Brown and Sally are going to be at their grandmother’s for Thanksgiving dinner. And two, Charlie Brown can’t cook. Linus and Snoopy come to the rescue, preparing a bizarre “meal” for Charlie Brown’s self-invited guests. The special’s funniest gag, Snoopy fighting with a lawn chair… completely bizarre, but hilarious. The dinner itself: Snoopy flinging food at the guests. Peppermint Patty’s meltdown over seeing they’re being served toast, jelly beans, popcorn, and pretzels. Charlie Brown and Franklin’s “greeting” at the door. Franklin gets only one solo line during the special, asking Peppermint Patty if he should dress up for the dinner. ABC airs this special annually during November. The “Peanuts: 1970s collection, volume 1” DVD set. The “Peanuts Holiday Collection,” which packages the stand-alone DVD with the Halloween and Christmas specials’ DVDs.